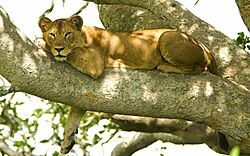 The lion (Panthera leo) is a large mammal of the Felidae (cat) family. Some large males weigh over 250 kg (550 lb). 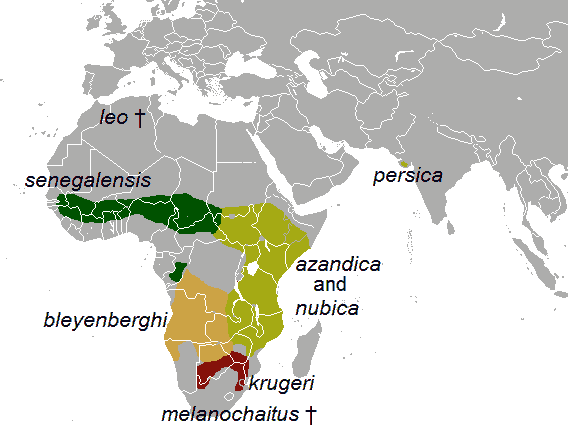 Today, wild lions live in sub-Saharan Africa and in Asia. Lions are adapted for life in grasslands and mixed areas with trees and grass. The relatively small females are fast runners over short distances, and coordinate their hunting of herd animals. In ancient times, lions roamed nearly every continent. Lions have disappeared from North Africa and southwest Asia in historic times. Until the late Pleistocene, about 10,000 years ago, the lion was the most widespread large land mammal after humans. The lion is now a vulnerable species. There was a decline in its African range of 30–50% over two decades in the second half of the 20th century. Habitat loss and conflicts with humans are the greatest causes of concern. There are only a quarter the number of lions in Africa as there were just 40 years ago. 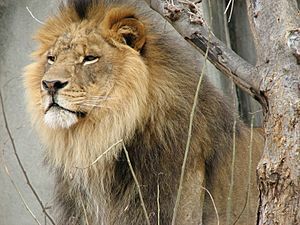 Lions are often called the "king of the beasts". They are used as symbols representing courage. They appear in heraldry more often than any other animal. They are an icon of courage and royalty. Lions live for 10 to 14 years when they are in the wild. When they are captured, they can live longer than 20 years. In the wild, males do not usually live longer than 10 years. This is because wounds from fighting with other males make their lives shorter. Despite the nickname King of the jungle, lions do not live in the jungle. They usually live in savanna and grassland. 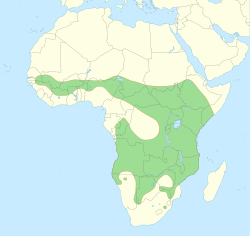 These areas do have bushes and trees, but lions are mainly adapted to catch prey on grasslands. 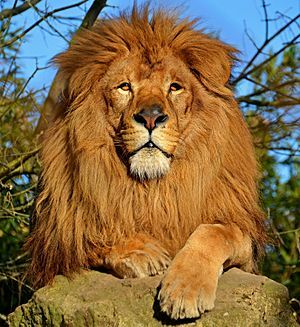 The lion's mane is the most recognisable feature of the species. The mane starts growing when lions are about a year old. Mane colour varies, and darkens with age. Research results indicate that environmental factors such as average ambient temperature influence the mane's colour and size. Mane length apparently signals fighting success in male–male relationships. 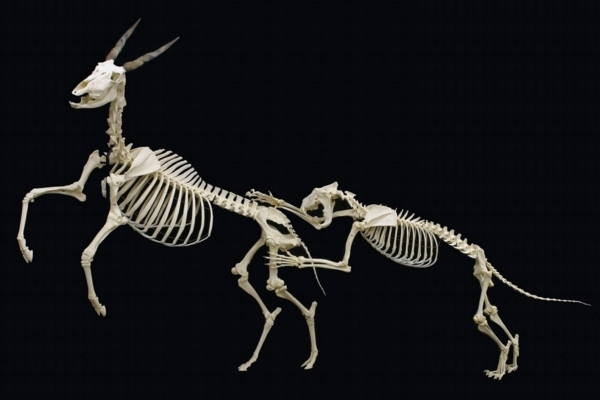 Darker-maned individuals may have longer reproductive lives and higher offspring survival, although they suffer in the hottest months of the year. 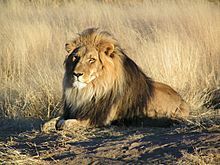 The presence, absence, colour, and size of the mane is associated with genetic precondition, maturity, climate, and testosterone production; the rule of thumb is the darker and fuller the mane, the healthier the lion. In the Serengeti National Park, female lions favour males as mates with dense, dark manes. For some lions the mane runs along the belly. When a male lion gets old, its mane may fall off. 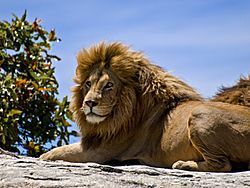 The main purpose of the mane is thought to protect the lion's neck and throat in territorial fights with rivals. There is no other big cat with such a dramatic difference in appearance between males and females. Lions have tawny, or yellowish brown, fur. They grow to a length of about 10 feet (3 metres) and stand about 4 feet (1.2 metres) tall. Male lions are larger than the lionesses (females), weighing as much as five men or about 550 pounds (250 kilograms). The more slender lioness usually weighs about as much as 400 pounds (180 kilograms). Both lions and lionesses have tufts on the end of their tails, something no other cat has. If you could touch a male lion's tail, you would feel a sharp bone tucked into the tail tuft. The white lion is a rare morph with a genetic condition called leucism, which is caused by a double recessive allele. It is not albino, but has normal pigmentation in eyes and skin. White lion individuals have been occasionally encountered only in and around Kruger National Park and the adjacent Timbavati Private Game Reserve in eastern South Africa. 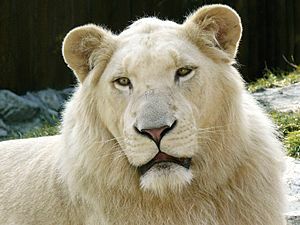 They were removed from the wild in the 1970s, thus decreasing the white lion gene pool. Nevertheless, 17 births have been recorded in five different prides between 2007 and 2015. The largest lion on record was almost 11.8 feet long and weighed nearly 900 pounds. Compared to other cats, lions are social. A group of lions is called a pride. In a pride of lions, there are related females, their young, and one or two adult males. Groups of female lions often hunt together. Lions are the only big cats that live in large groups. Ten to forty lions may live in a pride. Each pride has a home area that is called its territory. 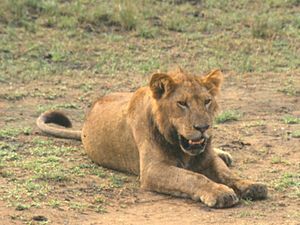 Lions do not allow other carnivores (meat-eating animals) to hunt in their territory. A territory can be as large as 260 square kilometres (100 square miles). The lions roar is distinct to each individual, and is used for territorial making, and warning off other lions in separate prides (or lone individuals). This however, is usually carried out by competing males. Also, they have the loudest roar of any cat, which can be heard for up to five miles. Lions are not built for speed like cheetahs, but go in for co-operative pack hunting. This is unusual in cats. The females usually do the hunting for the pride. However the males can sometimes help if needed, to take down large animals. It also has long retractable claws which act like grappling hooks, to keep hold of the prey. Even though a lion is good at killing prey for food, they are not among the most dangerous animals for humans. Lions are carnivores and scavengers. Carrion makes up more than 50% of their diet. Lions scavenge animals either dead from natural causes (disease) or killed by other predators. They keep a constant lookout for circling vultures, because this means there is a dead or injured animal close by. Lions eat large prey, such as gazelles, antelopes, zebras, wildebeests, giraffes, and buffalo. They have been known to take down even elephants, but then only with all of the adults of the pride participating in the kill. Even elephants fear hungry lions. When food becomes scarce, lions will hunt smaller prey or sometimes eat the kills of other animals. Lions can eat up to 69 kg of meat a day. A lion can run as fast as 50 mph for short distances and can leap a distance of more than 30 feet, though most prey animals can run much faster than the average lion. 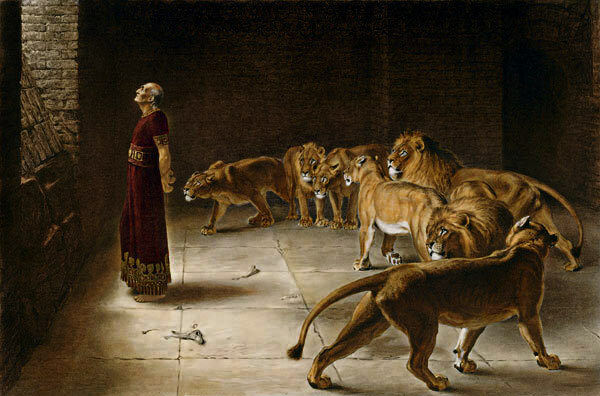 Therefore, lions hunt in fairly well organized groups and stalk, or sneak up on, their prey. They may try to surround them first, then make a swift, sudden charge from the tall grass. A lion's eyesight is five times better than a human's eyesight, and it can hear prey that is more than a mile away. The grass where lions live is not short and green but grows very tall and is a light brownish color most of the time. The lions' fur is the same color as this grass, making it difficult for other animals to see them. Coloring that helps to hide an animal or thing is called "camouflage". Lions might spend hours stalking prey but the actual kill is made in just minutes. After a kill is made, the females let out low roars. This tells the pride to join them for a meal. Adult males eat first, followed by females, and then cubs. It may take up to 4 hours for a pride of lions to finish eating. Lions rarely eat an entire kill, hyenas and vultures finish the rest. After eating, a thirsty lion may drink for as long as 20 minutes. To avoid the dangerous heat of the mid-day sun, lions usually hunt at night when the dim light helps to keep them hidden from their prey. Lions have very good night vision so the darkness does not pose a problem for them. Animals that are active at night like lions are called nocturnal creatures. 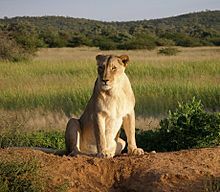 A lioness is ready to have young when she is 2-3 years old. Baby lions are called cubs. Cubs are born after 3 1/2 months. The cubs are born blind; their eyes do not open until they are about a week old, and cannot see well until they are about two weeks old. Lions do not have a den (home) where they would live for a long time. The lioness conceals the cubs in thick bush, gullies or rocky outcrops. If the hiding place has been seen by other predators, then the lioness will move the cubs to a new hiding place. The cubs will be introduced to the pride at about 6 weeks old. 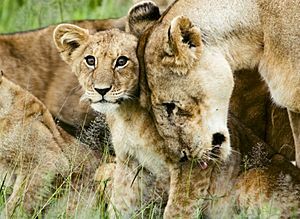 The cubs are very vulnerable when the lioness goes out to hunt and needs to leave the cubs behind. Also, when a new male takes over a pride from another male, he usually kills all of the cubs. The cubs' mothers will then mate with the new pride male, which means that the first batch of new cubs will be his offspring. A litter of 2-6, usually 2-3, cubs are born and most of the time only 1-2 cubs survive until introduced to the pride where they are protected by the whole pride. In zoos lions have been known to breed with tigers. If the parents are a male lion and a female tiger, it is called a liger. A tigon comes from a male tiger and a female lion. 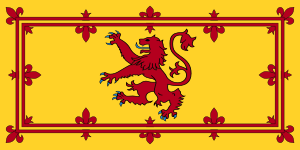 Lions appear in heraldry more often than any other animal. They traditionally symbolise courage, valour and royalty. They may appear as a charge on the shield or as a crest in various ways, one reason why lions are shown in so many different ways is because when heraldry developed, a lot of people wanted a lion on their coat of arms, but no two coats of arms can be the same. Lion Facts for Kids. Kiddle Encyclopedia.